When my sweet co-worker brought me a bunch of her extra tomatillos, the first thing I thought to make was Mexican salsa verde. 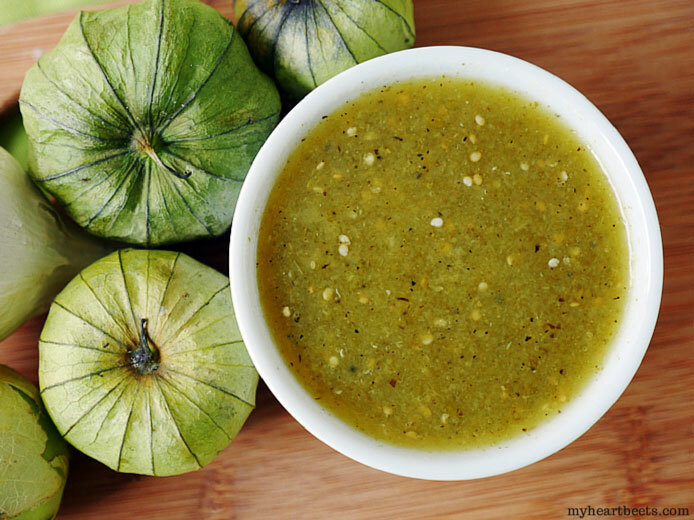 You can’t have salsa verde without tomatillos and since Mexican food is one of my favorite cuisines (okay, I’ll be honest – all cuisines are kind of my favorite), I knew that I’d be making some spicy green sauce that night. My roasted salsa verde is pretty incredible. It’s perfect on enchiladas (made with my paleo naan), carnitas and on top of eggs. I’ve been eating this spicy and delicious salsa by the spoonful. It seems like every country has their version of green sauce. Indians have green chutney, Argentinians have chimichurri, and Italians have their own salsa verde, gremolata and pesto. I’m sure there are plenty more green sauces out there that I don’t know about – if you know of one that I’ve missed, let me know in the comments. Food just so happens to be an obsession interest of mine and I’m always up for learning new food-related things. 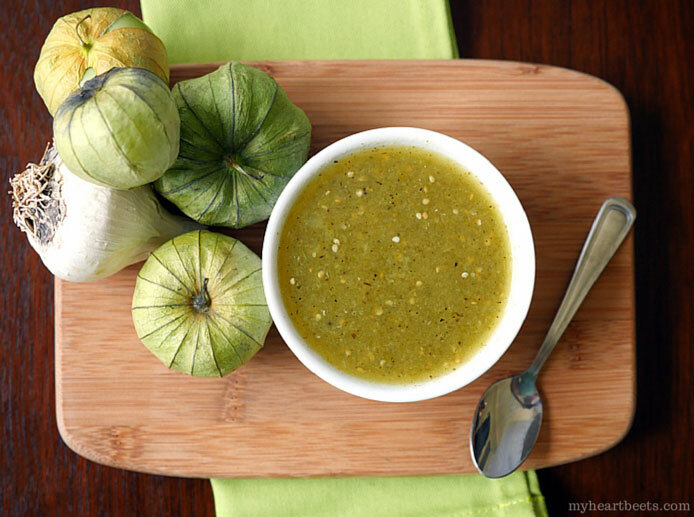 So, to make this salsa verde, you first have to broil several ingredients to help concentrate the flavors. Put the roasted ingredients (tomatillos, jalapeno, garlic, onion) in a blender along with some cilantro, lemon juice and salt… and bam – you’ve got Mexican roasted salsa verde. So simple and so delicious. Broil tomatillos, garlic, jalapeno and onion for 10 minutes, flipping the vegetables over at the halfway mark. Pour the roasted ingredients (and juices) into a blender along with the lemon juice, cilantro and salt. Blend until smooth. 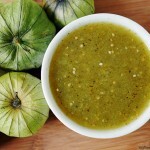 I love green sauces of all kinds, especially salsa verde! Have you ever tried zehug? I have no idea the exact nationality but there’s a Mediterranean restaurant where I live that makes it. I think it’s a combo of green chiles, cilantro, spices and olive oil. It’s super spicy and its served atop another dip called “turkish dip” with lots of pita bread. It’s incredibly delicious even without pita. I eat it with carrot/celery sticks…or with a spoon. Alejandra, I haven’t tried zehug or turkish dip – sounds delicious though! I’ll have to look these up 🙂 Thanks for letting me know about them! Your recipes never disappoint, Ashley. Can’t wait to try this one!